Amber is the publicist of Raw Fiction. She lived in NYC, Florida, Connecticut and then NYC again, and has compiled her experiences in her writing. Some are blatant and most are nuanced. When she’s not watching Supernatural or dreaming about the films she’ll make in college and afterward, she’s thinking about the next thing to write. Just like with everyone else, the human experience fascinates her. Things that are aesthetically pleasing and emotional inspire her the most. But she can’t name a favorite author. She flits from book to book, author to author, discovering what she likes and doesn’t like, and applies the experience to her work. Karen is the graphic designer of Raw Fiction (she designed that clever logo and header you’re looking at). In her free time, she annoys her close friend Jackie, makes him eat weird things, and draws on him occasionally. She likes to think he was her outspoken servant in their past lives, but he’s not very fond of the idea. She paints when she can, and likes to surprise her violin teacher when she actually picks up her violin to practice. But of course, Karen lives to write. Not too long ago, she was a bit lost. She couldn’t grasp what her purpose was in the humdrum of living and she had considered dropping out of high school to become a hermit traveler in a place far, far away to learn the meaning of life and then having a sky burial at the end of her time. She thought it noble. Then one day, she woke up and feverishly wrote and wrote and found that she had an uncanny knack for it. Soon, her plans of becoming a hermit traveler disintegrated, which is unfortunate because she would’ve had fun getting blisters as she ran away from bears and dying a bloody, gruesome death at the claws of some hungry predator. Now, she just hopes to escape the clutches of Brooklyn Tech. Hello! I'm Cha-Lisa, 17 and an avid reader. I tend to lean towards the fantasy/ sci-fi/ paranormal type of books but I'll try anything that catches my interest. I love to read books by Scott Westerfeld, John Green, Cassandra Clare and many others. When I'm not reading books I'm usually writing, reading fanfiction, on Tumblr or a weird combination of all three. I hope you enjoy our writing and maybe even participate. Ruth Tirado is a Bronx-born Dominican writer, currently 18 years old and manager of this literary project. She also works as a social activist in her community in the South Bronx. When she's not working, she's usually running all over the place with a variety of hobbies. Anyone who knows her will tell you that she's a huge bibliophile. She's usually a fan of young adult novels like The Fault In Our Stars by John Green or literature with complex characters like Othello by William Shakespeare. (But really, she'll read anything with an interesting plot and complex characters!) In her spare time, she does her fair share of writing and is often bouncing between different styles and genres of writing. When Ruth is nowhere near a pen or a pencil, she likes watching shows like Doctor Who, Supernatural and Sherlock. Not only a proud Nerdfighter, Ruth will boast of being a Timelord who the Sorting Hat placed in Ravenclaw. 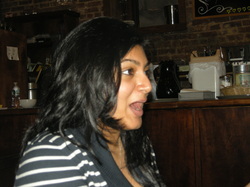 Nisha Wadhwani is the Editor-in-Chief of Raw Fiction, a student, a writer, and a reader, among many other titles. She enjoys a large variety of genres and reads almost anything, so long as it’s well written. She’s addicted to coffee and shopping and is convinced her old English professor was a spy. When she isn’t reading or writing, she’s off to save the world from bad grammar… or to play with cute puppies.